All praise the zipper: the ubiquitous, maintenance-free, no muss, no fuss fastener that trumps both buttons and Velcro! Zippers operate smoothly, silently and safely day in and day out, often in close proximity to our most sensitive bodily parts yet they rarely – “There’s Something About Mary” excepted – cause us anxiety or grief. 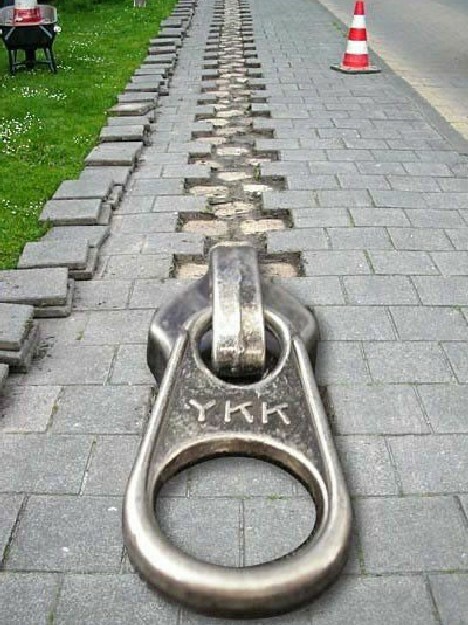 These 10 toothy examples of zany zipper art illustrate the mix of appreciation, admiration and YKK-stamped tabs by which society holds these fascinating fasteners. Artist Ellen Rixford knows how to grab one’s attention, as this zippered walnut shells, er, shows so well. 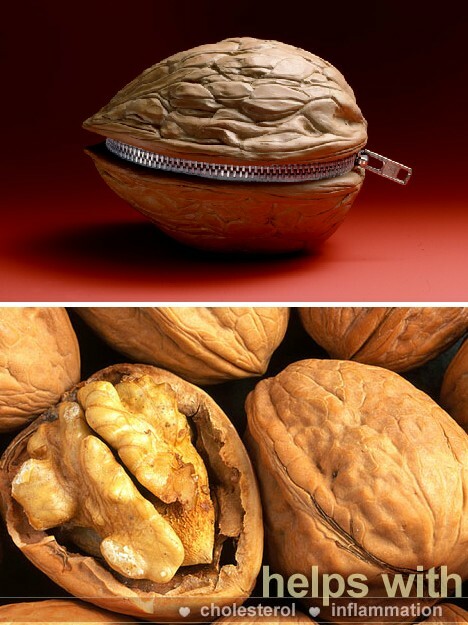 The walnut is actually crafted from clay, is 6 inches long and is highlighted by an industrial zipper. Rixford created this striking image for a drug company advertisement… perhaps regarding a non-surgical treatment to replace testicular surgery. Fly fishing anyone? 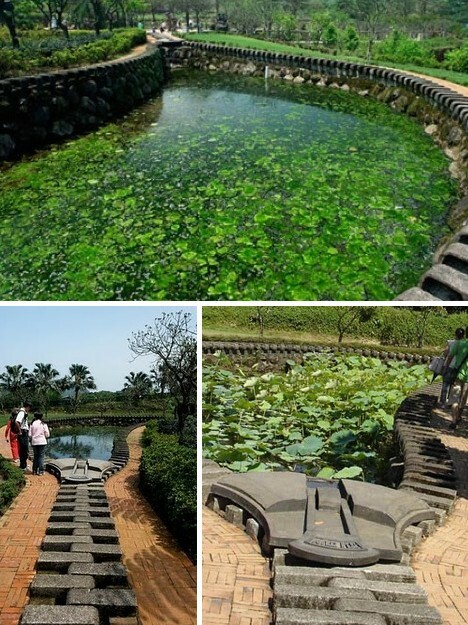 Get your rod (and reel) to Taiwan, where the lushly landscaped grounds of the Juming Museum are graced with a most unusual pond. 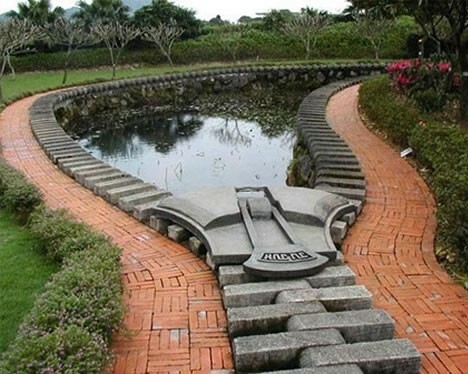 Designed by respected Taiwanese artist and sculptor Ju Chun, the Zipper Lotus Pond was completed in 2009. Sharp eyes may notice that the zipper slider carries the logo “JU-JUN”. It’s not clear exactly what the artist’s intent was in using this logo though the similarity to his name may offer a clue. When zipping your lips isn’t enough… yes, this is a photoshop. Not completely though, the zipper hardware was added to an actual “lingua bifida” body modification for a Worth1000 photoshop contest. 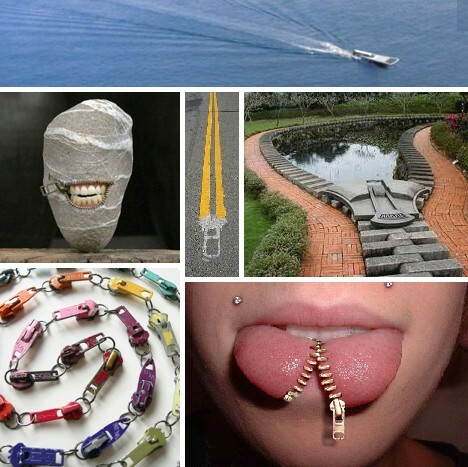 Considering the increasing number of bodymods that have crossed the Net of late, we may yet see an actual zippered tongue some day. You just won’t see it in my bathroom mirror. 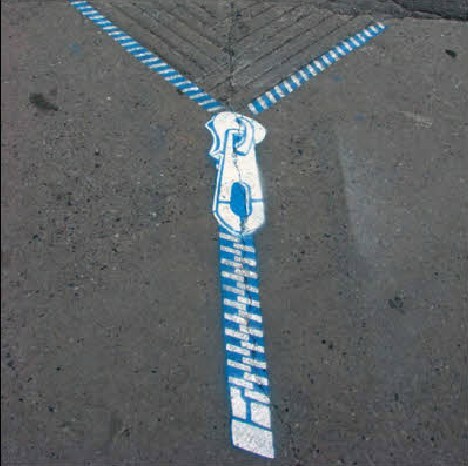 This group of images highlights zippers that have been painted or otherwise integrated into streets, avenues, boulevards and other paved pathways. One might ask (in a Seinfeld-esque voice), “What’s the deal with zippers and roads?” Perhaps artists note some correlation between the role of roadways in society and the functionality of zippers on an individual’s clothing. Or, maybe they just need sufficient space. 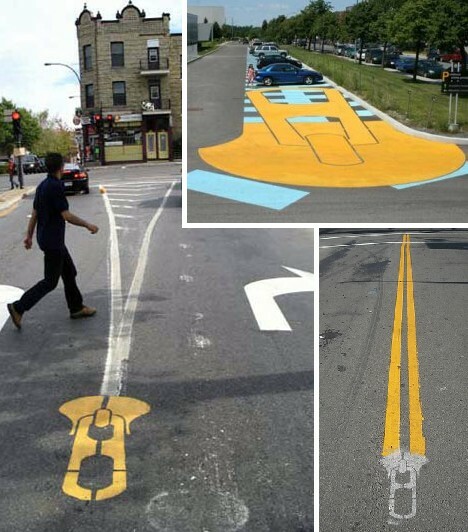 While paint and chalk make sense for roadway artwork, more obtrusive installations such as the Big Zip above are best suited to sidewalks and soft shoulders. Pedestrians and bicyclists may disagree, however. Guys who already have trouble “unwrapping” their dates aren’t going to be thrilled by the Zipper N3 dress. Designed and created by 31-year-old Chilean artist Sebastian Errazuriz, the intention wasn’t to facilitate hanky panky but instead provide women with a so-called “credit crunch dress” that can be adapted to form over 100 different styles. Errazuriz used 120 zippers to make the dress, which he hopes to have mass-produced by a major clothing firm. Amalia Versaci has got a name made for fashion and indeed, the Rhode Island School of Design grad focuses her creative energies on clothing and accessories. Her special emphasis is on the zipper, however, and her designs often employ zippers and parts thereof in original yet appealing ways. 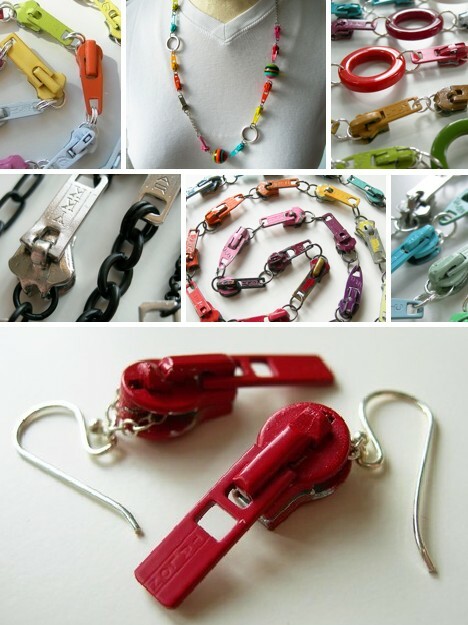 Versaci has taken a special interest in vintage and upcycled zippers, taking inspiration from the shapes and designs popular when zippers were as new, exciting and futuristic as Velcro is today. 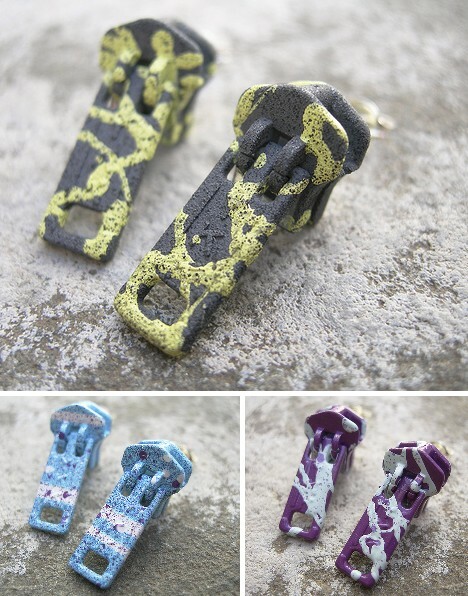 Hear no evil with Amalia Versaci’s zipper slide earrings! 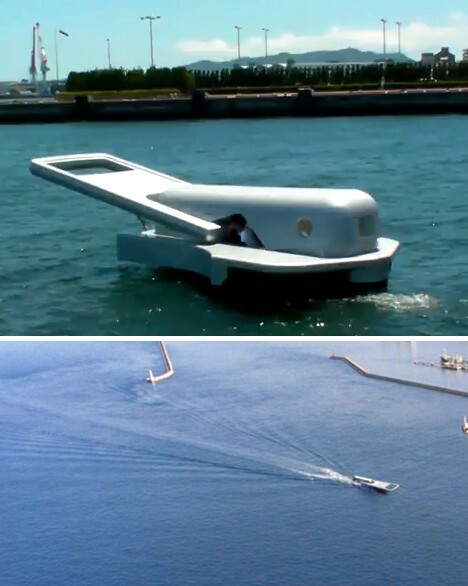 I SAID, HEAR… ok, we’ll move on. Upcycling vintage zipper slides and adding today’s colors, tones and shades adds up to an attractive combination well suited for today’s New Traditionalists. Jewelry isn’t the only purpose Versaci dedicates her zipper creations. 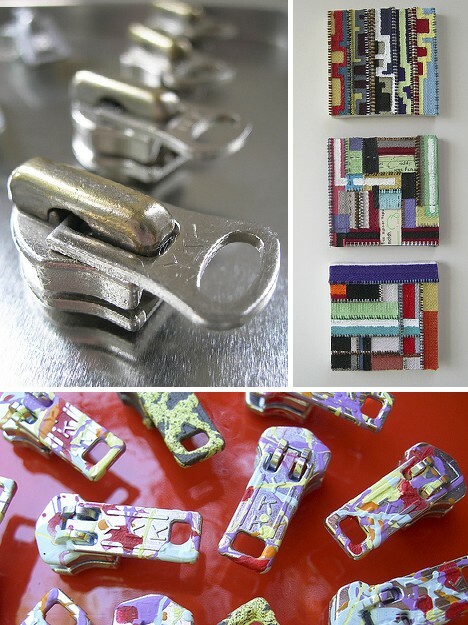 Above are magnets made from heavy-duty YKK industrial zipper slides and collages crafted from vintage zippers still attached to their backing fabric strips. 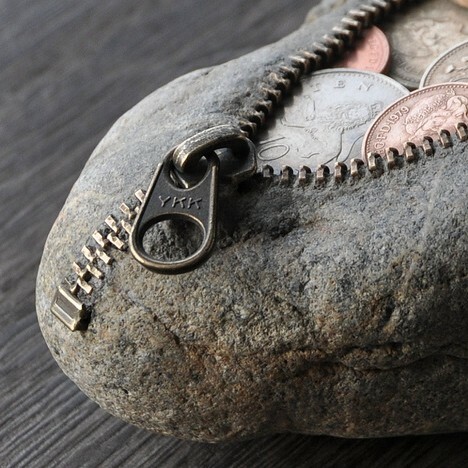 Part of the fascination of fossils is that what’s been locked in rock for countless millions of years is suddenly displayed before your very eyes. 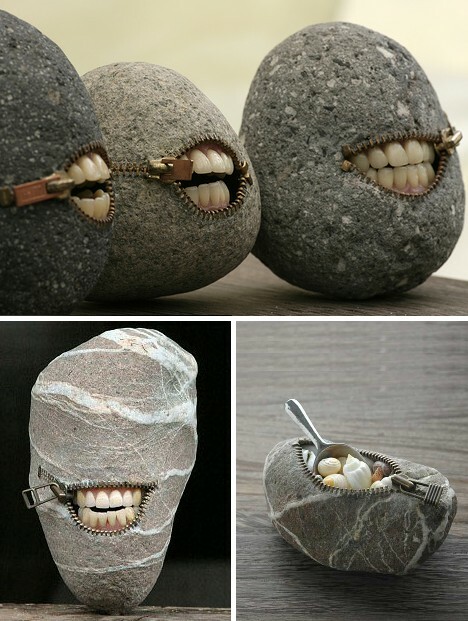 Hirotoshi Itoh‘s zippered stones are something like that, except weirder. From skull-like grinning boulders to congealed coin purses to a soupcon of seashells secreted in silica, Itoh offers a glimpse into the heart of rocks whose concealed treasures are revealed with a mere casual zip. Creepiest, of course, are Itoh’s granitic grinning stones. Funny, I don’t recall Han Solo smiling as he gazed out from Jabba’s imprisoning block of Carbonite… unlike Itoh’s mouthy marbles, I guess he just wasn’t into it. The cool thing about zipper tape is that it can be used to reveal heretofore un-noticed shapes and structures that COULD be zipped but aren’t. 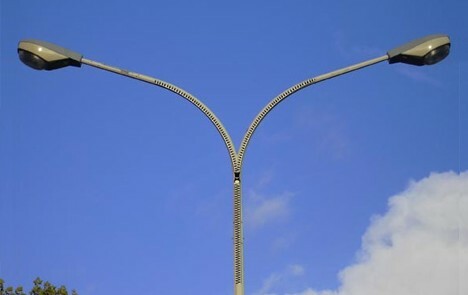 Forked tree limbs, bipod street lights, anything that conforms to a Y-shape (don’t get cheeky now)… just zip it! Benoit Lemoine has made somewhat of an artistic career for himself being the Banksy of Zipperdom, an odd avocation if there ever was but hey – someone’s gotta do it. 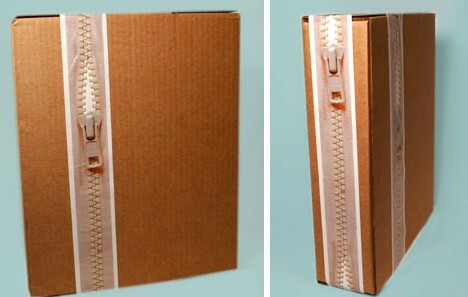 A variation on the zipper tape Lemoine chooses to use is Popped Zipper Tape, which makes your parcel, package, briefcase or whatever look like it, well, popped a zipper. Winters are long & cold up in Minot, ND, and residents have come up with some interesting ways to avoid cabin fever, snow blindness and the like. 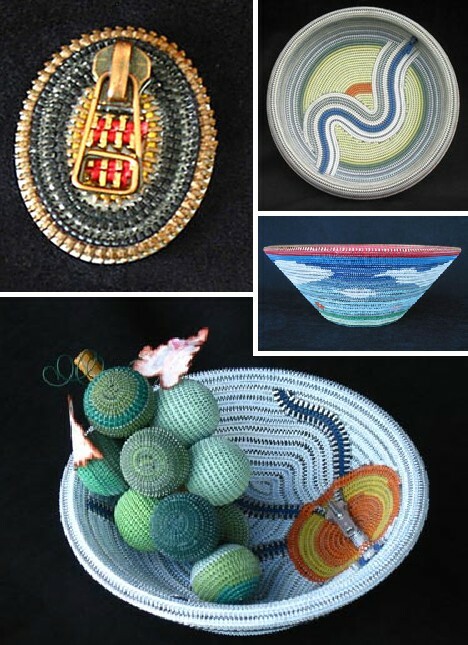 One of the coolest (sorry) ways to get through those frigid months – the ones with an R in them – is Original Zipper Art as practiced and promulgated by Karen L. Davidson. From pins to plates to Christmas Trees and more, Davidson knows how to make a zipper do tricks that’ll bust your buttons. Davidson takes advantage of the wildly diverse color palette bestowed upon today’s plastic, polyester and metal zippers by manufacturers, thus avoiding messy paints and volatile solvents. A bonus is that the colors are either baked on or mixed into the zippers’ substrates. 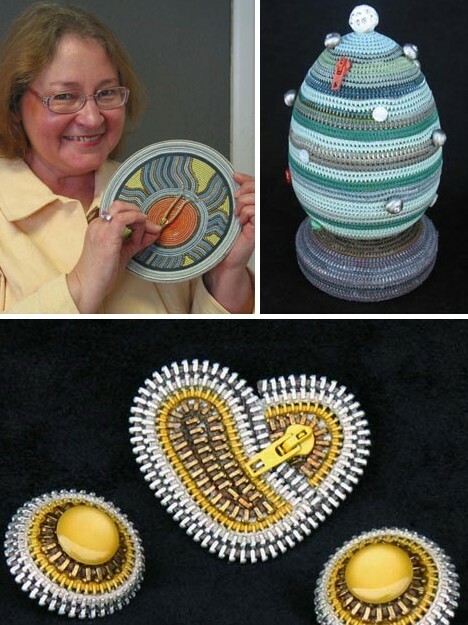 Designed to be long lasting from the start, Davidson’s zippers do the same for her art! 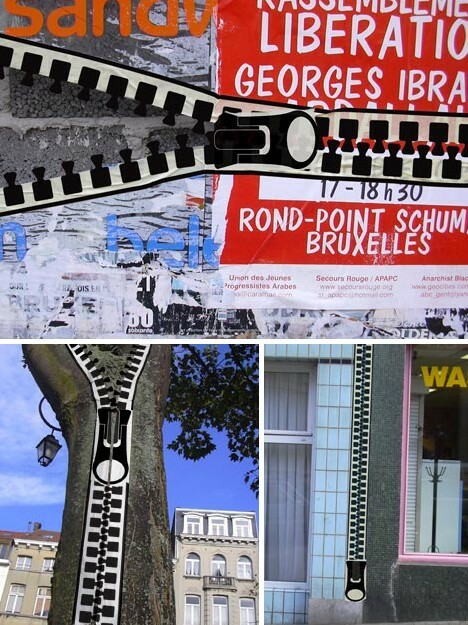 Zippers: where would clothing (and zany art) be without them? Buttons and Velcro have their good points but zippers are faster than buttons and they make a cool sound; not that painful ripping sound that so irritated Morty Seinfeld and doubtless many others. The Art of the Zipper simply completes the zipper’s long interaction with modern society by meshing the functional with the creative. Not much more to say… so I’ll zip it.